These services can be used by any number of participants, and include an order of service. Paradoxes Of The Passion examines the circumstances leading up to the crucifixion of an itinerant preacher from Galilee. What Shall I Do, Then, With Jesus Who Is Called Christ? brings us face to face with Pilate's question that has echoed down the centuries. 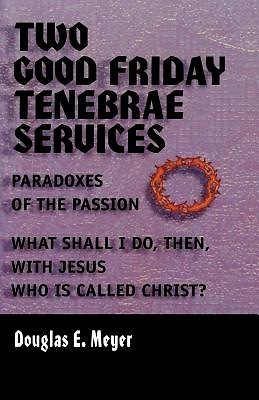 Each of the Tenebrae services in this booklet can be used by any number of participants. An order of service for your bulletin preparations is also included. Paradoxes Of The Passion brings to the worshiping congregation the circumstances leading up to the crucifixion of an itinerant preacher from Galilee who was no less than the long-awaited Jewish Messiah. The seven paradoxes are interspersed with hymns and prayers. What Shall I Do, Then, With Jesus Who Is Called Christ? To Pilate's surprise the crowd sought freedom for the murderer Barabbas rather than for Jesus. Pilate then asked the question that has echoed down the centuries to every man, woman, and child who has ever heard the Gospel: ""What shall I do, then, with Jesus who is called Christ?"" In this thought-provoking Good Friday Tenebrae service, Douglas Meyer explores how various key characters in the Passion story answered that question. Then he considers how The person in the pew answers that question today. Douglas E. Meyer graduated from Concordia Theological Seminary in Fort Wayne, Indiana with an M.Div. degree in 1981. He has served parishes at Shobonier and Tuscola, Illinois, and Naples, Florida, and is currently serving at Salem Lutheran Church in Salem, Illinois.